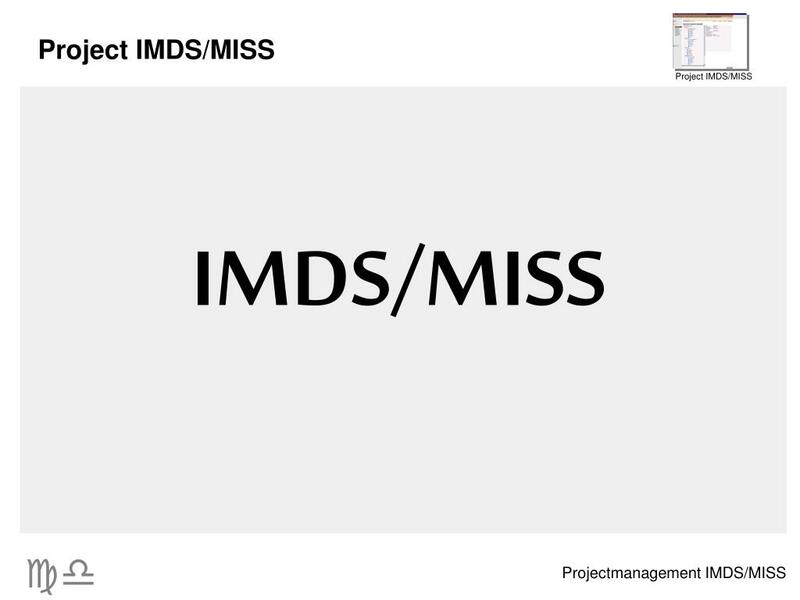 IMDS/MISS. 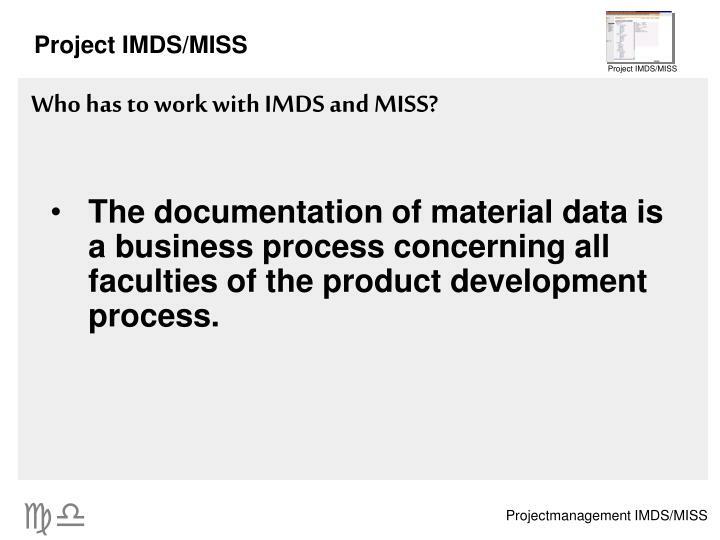 What is IMDS? 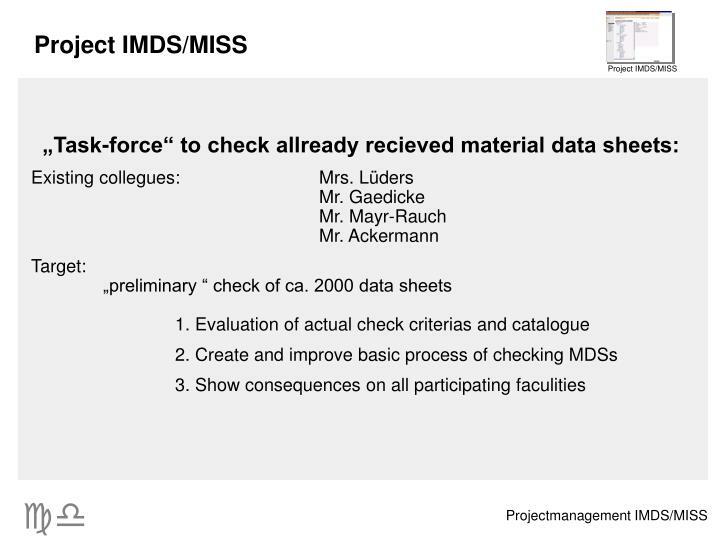 What is MISS?. 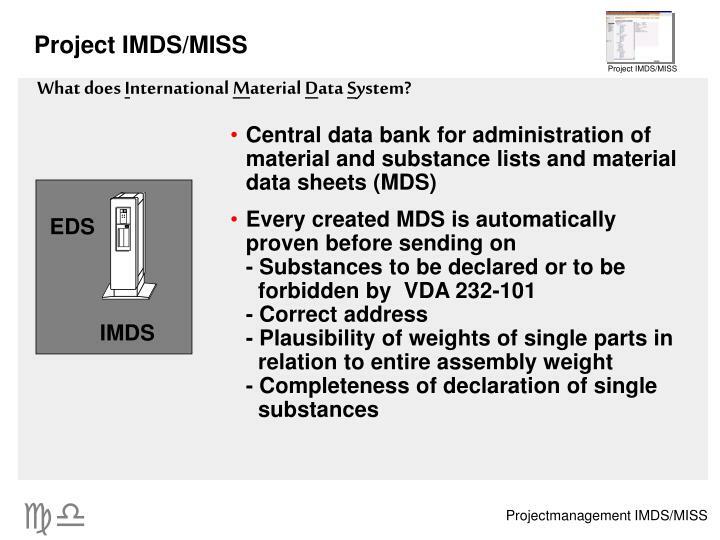 IMDS is the I nternational M aterial D ata S ystem for the record of material data of parts, subassemblies etc. of vehicles. 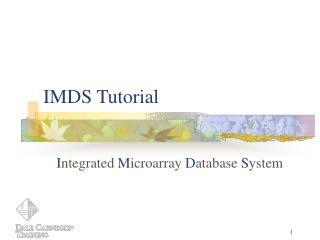 What is IMDS? 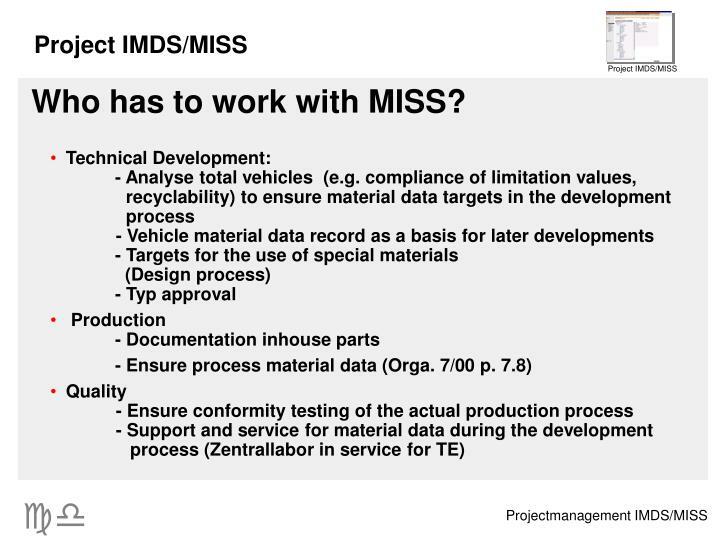 What is MISS? 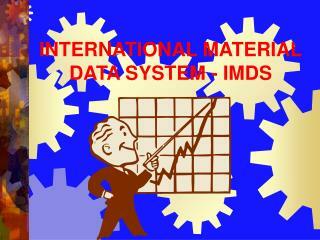 IMDS is the International Material Data System for the record of material data of parts, subassemblies etc. 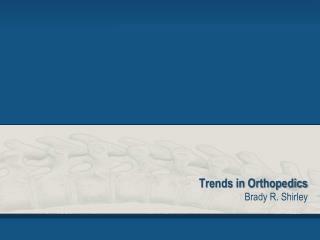 of vehicles. 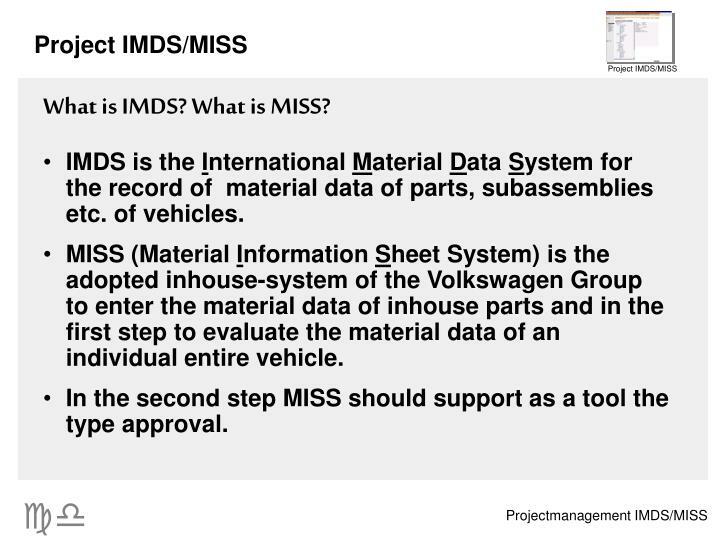 MISS (Material Information Sheet System) is the adopted inhouse-system of the Volkswagen Group to enter the material data of inhouse parts and in the first step to evaluate the material data of an individual entire vehicle. 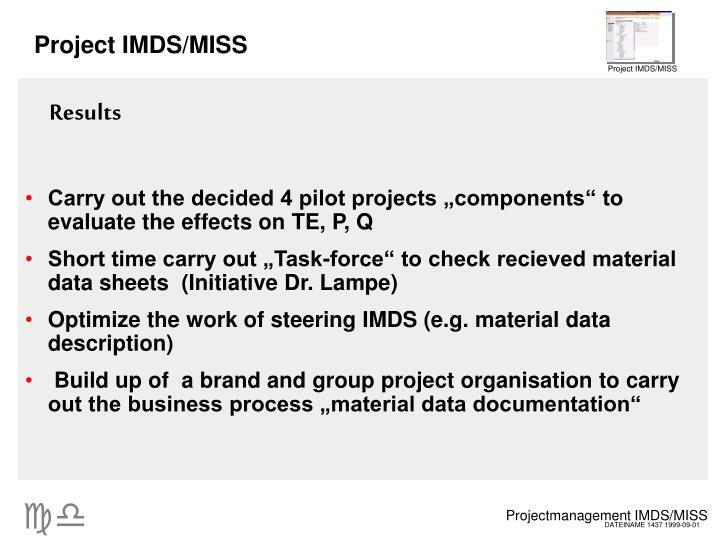 In the second step MISS should support as a tool the type approval. 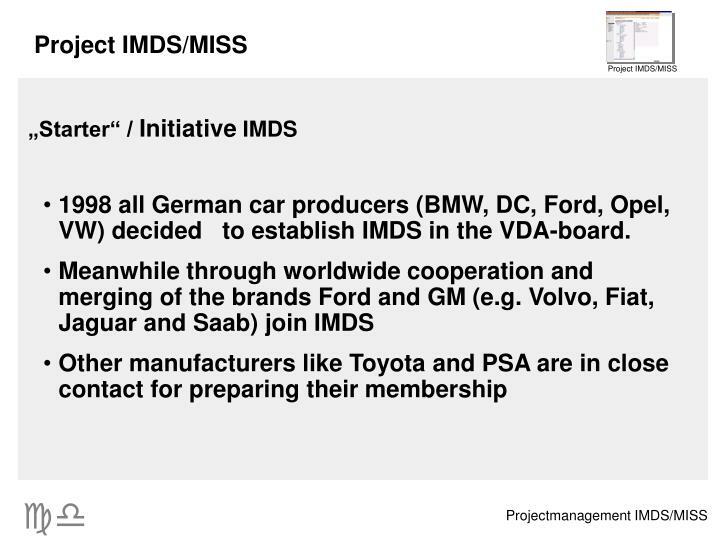 1998 all German car producers (BMW, DC, Ford, Opel, VW) decided to establish IMDS in the VDA-board. 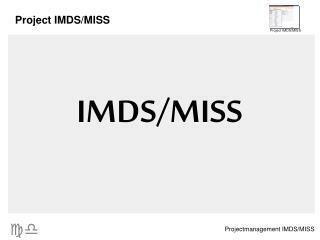 Why do we need IMDS and MISS? 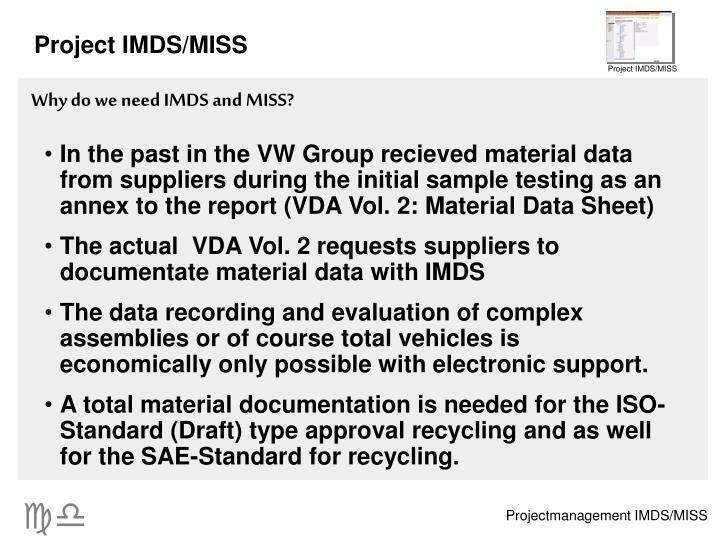 The data recording and evaluation of complex assemblies or of course total vehicles is economically only possible with electronic support. 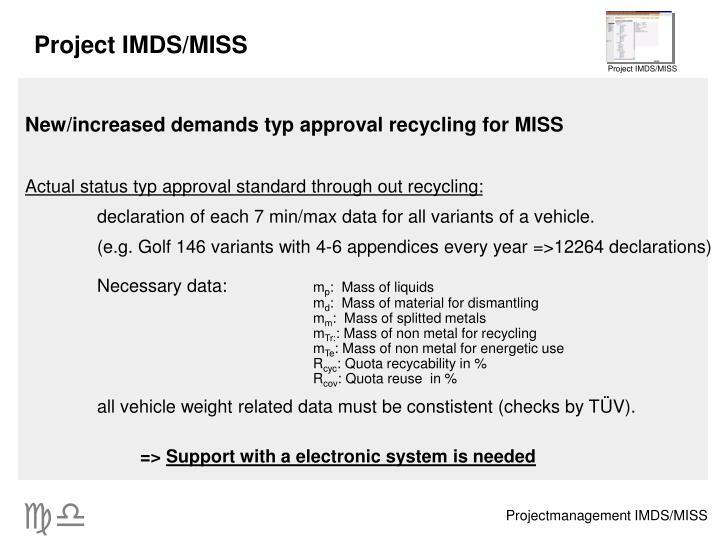 A total material documentation is needed for the ISO-Standard (Draft) type approval recycling and as well for the SAE-Standard for recycling. Who has to work with IMDS and MISS? 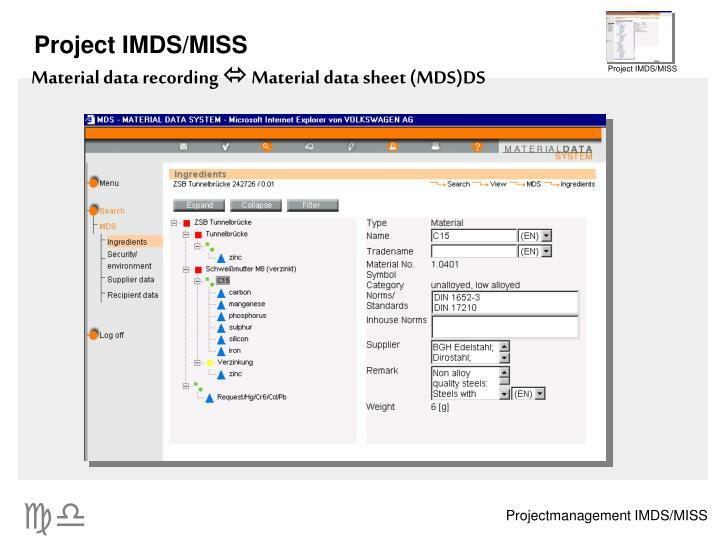 The documentation of material data is a business process concerning all faculties of the product development process. 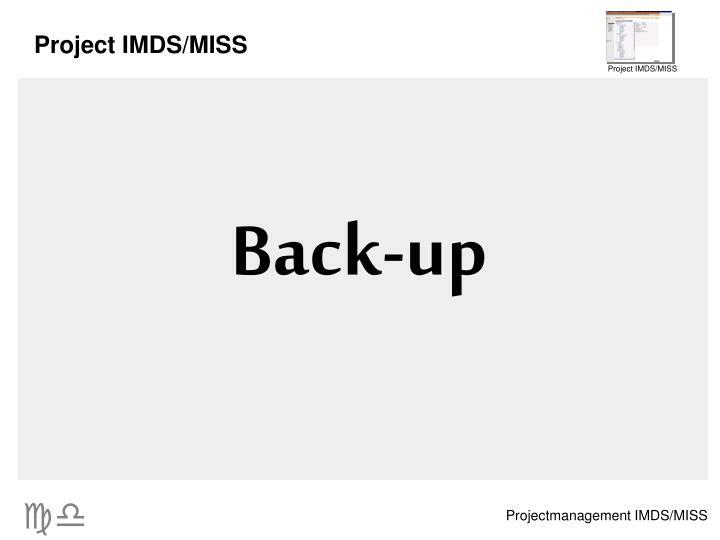 Who has to work with IMDS? 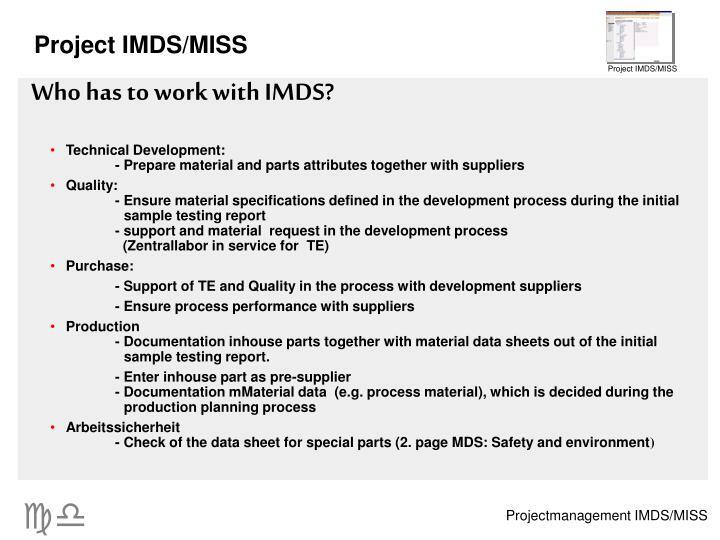 Production	- Documentation inhouse parts together with material data sheets out of the initial sample testing report. 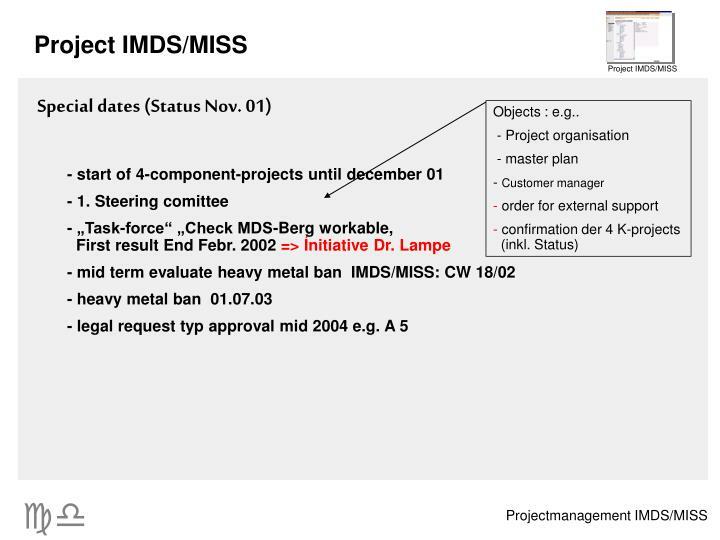 Who has to work with MISS? 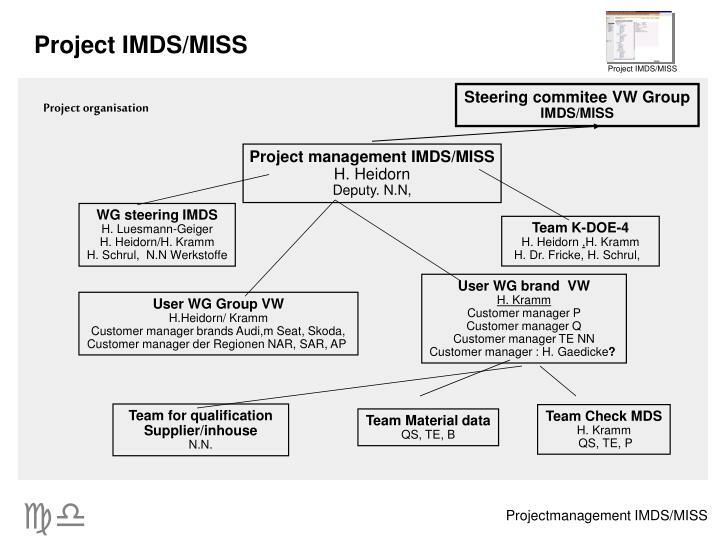 Customer manager : H. Gaedicke? 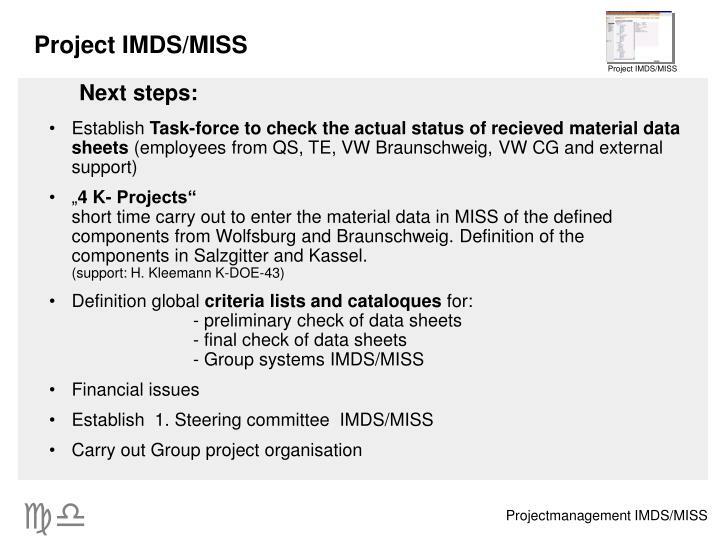 What does International Material Data System? 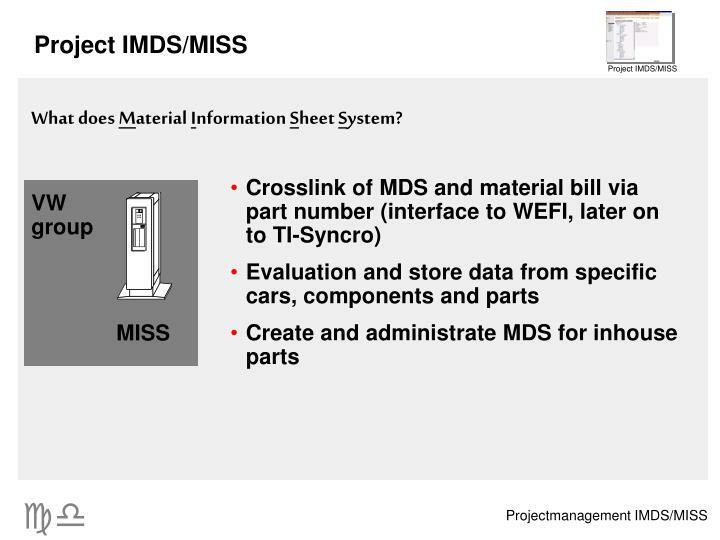 What does Material Information Sheet System? 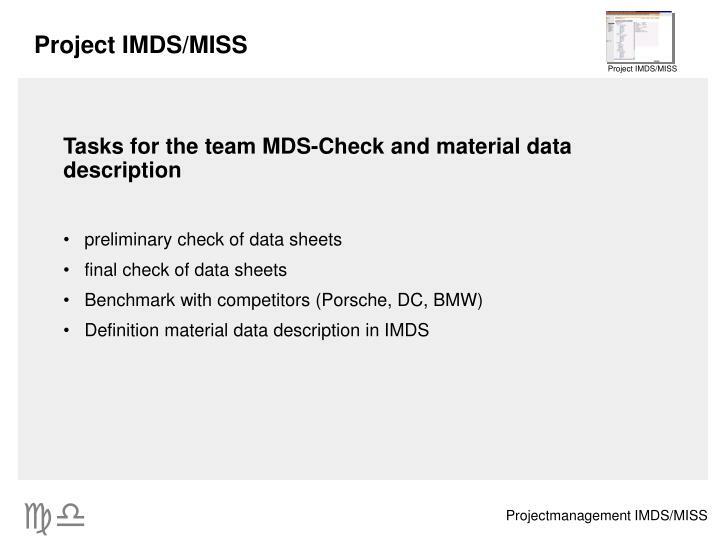 declaration of each 7 min/max data for all variants of a vehicle. 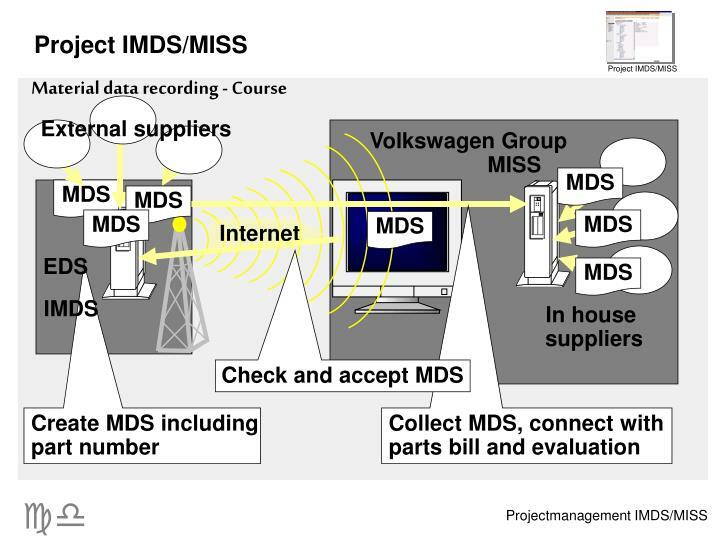 all vehicle weight related data must be constistent (checks by TÜV). 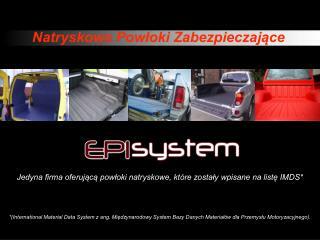 End Life Vehicle Directive; 2000/53/EC Demonstrating Compliance through IMDS. 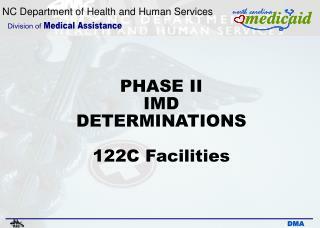 -End life vehicle directive; 2000/53/ec demonstrating compliance through imds. 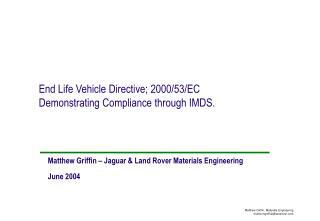 matthew griffin – jaguar &amp; land rover materials engineering june 2004.